When Tel Aviv University researchers Dr. Ran Barkai, Miki Ben-Dor, and Prof. Avi Gopher of TAU's Department of Archaeology and Ancient Near Eastern Studies examined the published data describing animal bones associated with Homo erectus at the Acheulian site of Gesher Benot Ya'aqov in Israel, they found that elephant bones made up only two to three percent the total. But these low numbers are misleading, the team says. While the six-ton animal may have only been represented by a tiny percentage of bones at the site, it actually provided as much as 60 percent of animal-sourced calories. The elephant, a huge package of food that is easy to hunt, disappeared from the Middle East 400,000 years ago — an event that must have imposed considerable nutritional stress on Homo erectus. Working with Prof. Israel Hershkovitz of TAU's Sackler Faculty of Medicine, the researchers connected this evidence about diet with other cultural and anatomical clues and concluded that the new hominids recently discovered at Qesem Cave in Israel — who had to be more agile and knowledgeable to satisfy their dietary needs with smaller and faster prey — took over the Middle Eastern landscape and eventually replaced Homo erectus. 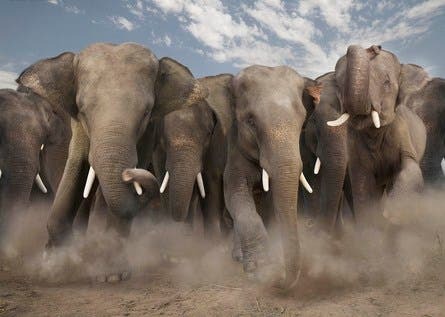 The findings, which have been reported in the journal PLoS One, suggest that the disappearance of elephants 400,000 years ago was the reason that modern humans first appeared in the Middle East. In Africa, elephants disappeared from archaeological sites and Homo sapiens emerged much later — only 200,000 years ago. Unlike other primates, humans' ability to extract energy from plant fiber and convert protein to energy is limited. So in the absence of fire for cooking, the Homo erectus diet could only consist of a finite amount of plant and protein and would have needed to be supplemented by animal fat. For this reason, elephants were the ultimate prize in hunting — slower than other sources of prey and large enough to feed groups, the giant animals had an ideal fat-to-protein ratio that remained constant regardless of the season. In short, says Ben-Dor, they were the ideal food package for Homo erectus. When elephants began to die out, Homo erectus "needed to hunt many smaller, more evasive animals. Energy requirements increased, but with plant and protein intake limited, the source had to come from fat. He had to become calculated about hunting," Ben-Dor says, noting that this change is evident in the physical appearance of modern humans, lighter than Homo erectus and with larger brains. To confirm these findings, the researchers compared archaeological evidence from two sites in Israel: Gesher B'not Yaakov, dating back nearly 800,000 years and associated with Homo erectus; and Qesem Cave, dated 400,000 to 200,000 years ago. Gesher B'not Yaakov contains elephant bones, but at Qesem Cave, which is bereft of elephant bones, the researchers discovered signs of post-erectus hominins, with blades and sophisticated behaviors such as food sharing and the habitual use of fire. Modern humans evolved in Africa 200,000 years ago, says Dr. Barkai, and the ruling paradigm is that this was their first worldwide appearance. Archaeological records tell us that elephants in Africa disappeared alongside the Acheulian culture with the emergence of modern humans there. Though elephants can be found today in Africa, few species survived and no evidence of the animal can be found in archaeological sites after 200,000 years ago. The similarity to the circumstances of the Middle East 400,000 years ago is no coincidence, claim the researchers. Not only do their findings on elephants and the Homo erectus diet give a long-awaited explanation for the evolution of modern humans, but they also call what scientists know about the "birth-place" of modern man into question. Evidence from the Qesem Cave corroborates this revolutionary timeline. Findings from the site dated from as long as 400,000 years ago, clearly indicate the presence of new and innovative human behavior and a new human type. This sets the stage for a new understanding of the human story, says Prof. Gopher.